The National Society of Decorative Painters. This is the society I've had the joy of being a member of since 1988. As most of you know, I'm a Decorative Design Painter and Interior Style Artist. was invited to visit and have dinner at the White House. The musical drum I painted is shown in the Society's graphic to the left. It was hand painted in several jeweltone colors all around with directions for stroke work Rosemaling designing to complete each instrument. at the George W. Bush Presidential Center in Dallas, Texas. Below is the blog post from the Society that was shared with me over the weekend with links to my post which I shared with you in blogland. I invite you to share in the fun of seeing the amazing theme for 2004. 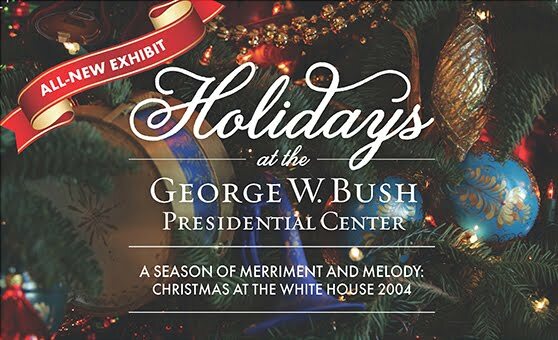 The new exhibit “A Season of Merriment and Melody” at the George W. Bush Presidential Center in Dallas, Texas opened on November 17 and is a replica of the 2004 White House Christmas tree, which featured more than 350 miniature musical instruments hand-painted by our members. Our Boots & Brushes of San Antonio Chapter visited center last month. They enjoyed classic holiday music, took photos with Santa and in front of the Christmas tree, and saw the original White House decorations from 2004! Current Past President Wendy Watson ADP shared pictures from the visit. A number of our members who painted the ornaments are reminiscing about their experience, one of them being current President Kathy Swigon CDA. Take a look at the ornament she painted for the tree. Another member is Celeste (Celestina Marie) who painted an ornament for the White House Christmas Tree in 1998 and 2004. “As a (SDP) member since 1988, I have improved my skill, met many great artists, studied alongside kindred spirits, and yes, even taken the road to the White House, she said. “What an honor it was for all of us!” You can read more about Celeste’s experience in this blog post on her website Southern Daydreams. Larry and Celeste with Laura Bush in front of the Blue Room Christmas tree 2004. You may ask, what happens to the ornaments once Christmas is over? The ornaments painted for the White House stay with the White House and are used in other ways in the future or displayed in the Library of Congress. The exhibit will be open to the public through January 8, 2017. To purchase tickets and for more information, visit BUSHCENTER.ORG/HOLIDAYS. Thank you for stopping by and sharing in my revisit from the Society for 2016. See you soon with more Christmas home decorating. Wishing you happy days as we countdown to Christmas. I did not know that you were a member of the National Society Of Decorative Painters. What a delight to be surrounded by other nurturing and talented artists and how thrilling to have been invited to the White House. The musical drum that you designed and painted is beautiful! I am so glad that you shared this information with us, I will be taking some of our family to see this! OMGosh, Celeste. I had no idea. None whatsoever. Thank you so much for posting this and letting everybody know. You should be so proud - what a feather in your cap. I can't even imagine. Going to save this e-mail and *study* it from top to bottom when I have a minute to give it my full attention. This is fabulous! I visited the library last Christmas and it was a delight. How wonderful! Wish I lived in the area!! That is such an honor and an experience you'll never forget. I love Laura Bush and felt even closer to her after reading her autobiography. What a beautiful lady she is as well as YOU! Hugs! Oh, my dear Celeset, what an honour and what a wonderful thing ! I am so proud of you and your wonderful paintings! Thank you for this great post! I am so sad, that I am so far away and don't have any chance to visit this exhibit! What a thrill that must have been to be invited to dinner at the White House, and get to meet the first lady! I know you both will never forget that. And to have your beautiful painted ornament on display is a real honor! What an interesting part of your life you have shared here with us. How exciting to have this upcoming event in January. How exciting, memories that will be with you always. Such an honor to be included and getting to go to the White House.That is a memory to treasure forever. p.s. you haven't aged since the 2004 photo. Your hand painted ornament was so pretty. How exciting for the beautiful tree to be featured at the GB Library! I so enjoyed this post, Celestina. What a honor to be able to grace the tree of the White House with your beauty and talent, and then to meet the first lady and have dinner at the White House, congratulations to you! Beautiful picture of you and your husband with the first lady. Thank you for sharing this remarkable piece with us. Very cool Celeste, I am not surprised that your work was featured. This is a fabulous honor, Celestina Marie, to have your beautiful ornament part of a White House Christmas tree. I really enjoyed this post. My husband worked in the Bush administration, and I remember visiting the White House at Christmastime one of the years he was in office. Such an honour dear friend to have your exquisite work in the White House. You are so very talented and just wish I lived near so I could go and see the Exhibition. WOW, Celeste! You have worked so hard for year to be at this level of your art. Bravo! ENJOY! What an honor Celeste!...you are so very talented!!! I remember finding out about your experience doing this for the White House Christmases. I can well imagine how you must hold the experiences dear to your heart. I would definitely go there if it was a bit closer to me! What an honor, to be invited to paint an ornament to this special ocation in The White House, Celeste. It must have been so exiting to be there, and to meet Laura Buch, too. Your drum is so beautiful. Fantastic memories for you and your husbond, dear!! Congratulations! Such a well-deserved honor! What a wonderful honor for you! How nice to revisit it. Thanks for sharing it with us. We all knew what a wonderful painter you are but now we know you are famous too! Hello Celestina, wow what an honor and how exciting. You are such a talented artist and so inspiring to others. I hope you are enjoying the holidays. Such an honor for you dear to have been part of our White House heritage. Your work is always truly beautiful. Bless you and thank you for sharing your wonderful memories. Oh WOW, Celestina, I did know. How very special to have painted ornaments for the White House. I watched the special the other night on decorating the White House this year. Thank you so much for sharing this wonderful experience with us. How very special. What an honor! I'm so proud of you. What a fabulous experience and well deserved. You are amazing! Thank you so much for sharing this!!! What an honor, Celestina! how wonderful to be recognized for your talents. Such a great memory for you! Thank you for sharing such a thrilling experience! what a honor for you, I'm sincerely happy for the success you had and are having today, you deserve it for sure, your skill in your art is indisputable and incomparable ! Que linda sua postagem. Gostei imenso. Linda pinturas! Estive um pouco ausente durante alguns dias. Mais não poderia deixar que o ano terminasse sem passar aqui pra deixar meu carinho e meus agradecimentos por termos caminhado pelo menos um pouco durante esse ano de 2016 nessa blogosfera. Muito obrigada! Congratulations, Celestina, for the honor and for your wonderful talent! I just want to take this opportunity to thank you for visiting my blog posts so frequently and always leaving such sweet comments. You are always so kind. Happy "Almost" New Year 2017! Oh my how exciting that must have been for you, and of course your ornament is just Gorgeous! !